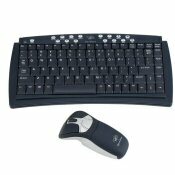 Gyration GC215 Go compact keyboard suite consists of Gyration GO 2.4GHz Optical Wireless Gyroscopic Air Mouse and compact cordless keyboard with whisper quiet keys. Gyration GC215 Go features gyroscopic motion-sensing technology for in-air use which provides navigation with no delay while the precise optical sensor is perfect for desktop use, and 2.4 GHz RF receiver with up to 3 – 9m range with no line-of-sight limitations. CyberAct!ve reviewed Gyration GC215 Go compact keyboard suite and gave it the rating of 4 out of 5, and concluded that Gyration GC215 Go is pricey but it’s an excellent way to use a computer from a sofa or without a desk with good points as ergonomic design and can works without a desk, while bad point is expensive.